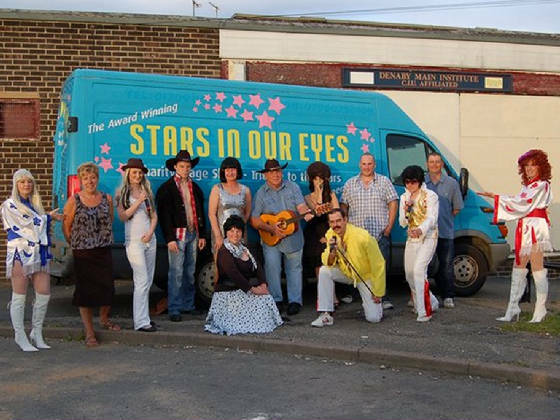 The performers in the Stars in Our Eyes Charity Roadshow give their time purely to raise money for good causes and for their own enjoyment. But don’t be fooled into thinking that the show is anything less than top quality entertainment. They create a spectacular evening, featuring a string of hits spanning six decades with incredible impressions of artists from Matt Monroe to Amy Winehouse. All this is complimented by an amazing light show and superb costumes. Originally formed by a group of friends in the Conisborough area, over the past six years, the show has helped to raise over £350,000 for good causes. Currently the cast boasts a whole host of performers, aged between 13 and 63, who give their versions of Elvis Presley, Freddie Mercury, Cher, Dolly Parton, Alice Cooper, Duffy ,Tony Christie and many others, in two action pacts sets, each lasting over an hour. The group regularly has members leaving to turn professional and hit the clubland circuit so they are always looking out for new talent. Joining up could be a springboard to entering the entertainment business, and who knows where that might lead. If you are interested, the group meets every Wednesday evening at the Denaby Institute. Anyone is welcome to come along and audition,or just watch, sing along or have a chat. On june 2nd. our founder/compere/friend Juddy Hamshaw sadley passed away.